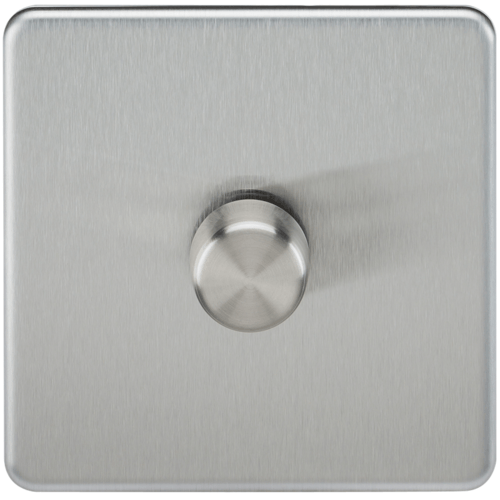 The Knightsbridge 1G 2 Way Dimmer Switches in Brushed Chrome is the ideal decorative upgrade for use in the modern home, businesses and hotels. The screwless design features an easy clip on cover with an internal gasket for moisture protection and matching screws. It has an ultra slim profile and is constructed from durable, and high temperature resistant thermoset plastic. Push on/off type trailing edge dimmer. *To operate with LED lamps, the lamp or driver/control gear must be compatible i.e. dimmable. This unit is not suitable for non-dimmable products. The 1 Gang switch measurements are Width 87.5mm x Height 87.5mm. Complies to all relevant safety standards and comes with a 15 year manufacturer guarantee and CE marked. The Screwless Dimmer Switches are also available in Black Nickel, Matt Black, Polished Brass and Polished Chrome.